You may do the first 3 exercises right away. Single knee to chest stretch: Lie on your back with your legs straight out in front of you. Bring one knee up to your chest and grasp the back of your thigh. Pull your knee toward your chest, stretching your buttock muscle. Hold this position for 15 to 30 seconds and then return to the starting position. Repeat 3 times on each side. Gluteal stretch: Lie on your back with both knees bent. Rest the ankle on your injured side over the knee of your other leg. Grasp the thigh of the leg on the uninjured side and pull toward your chest. You will feel a stretch along the buttocks on the injured side and possibly along the outside of your hip. Hold the stretch for 15 to 30 seconds. Repeat 3 times. Gluteal Sets: Lie on your stomach with your legs straight out behind you. Squeeze your buttock muscles together and hold for 5 seconds. Relax. Do 2 sets of 15. You can do the rest of the exercises to strengthen your gluteal muscles when the sharp pain goes away and you have just a dull ache when you do the gluteal sets. Prone hip extension with bent leg: Lie on your stomach with a pillow under your hips. Bend the knee on your injured side. Draw your belly button in towards your spine and tighten your abdominal muscles. Lift your bent leg off the floor about 6 inches (15 centimeters). Keep your other leg straight. Hold for 5 seconds. Then lower your leg and relax. Do 2 sets of 15. Resisted hip extension: Stand facing a door with elastic tubing tied around the ankle of your injured side. Knot the other end of the tubing and shut the knot in the door near the floor. Draw your abdomen in towards your spine and tighten your abdominal muscles. Pull the leg with the tubing straight back, keeping your leg straight. Make sure you do not lean forward. Return to the starting position. Do 2 sets of 15. 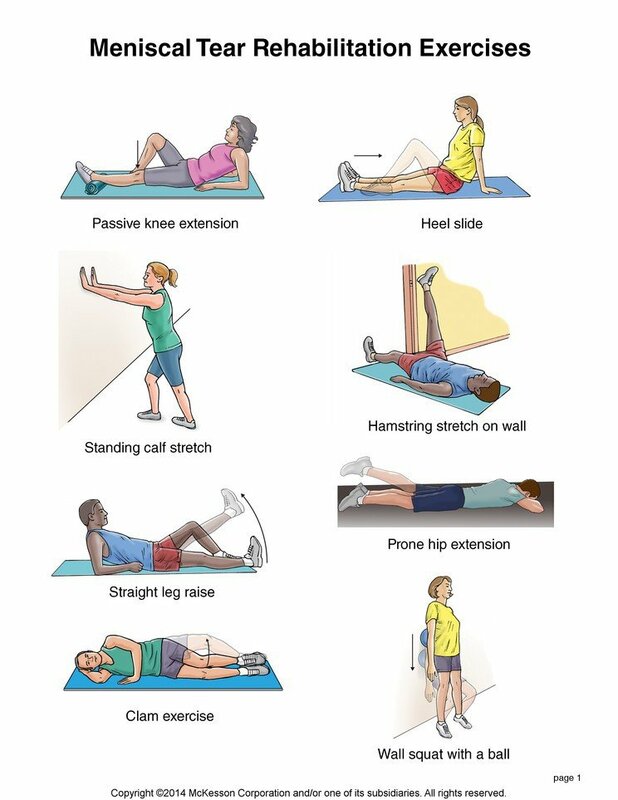 Resisted hip abduction: Stand sideways near a door with your injured side further from the door. Tie elastic tubing around the ankle on your injured side. Knot the other end of the tubing and close the knot in the door near the floor. Pull the tubing out to the side, keeping your leg straight. Return to the starting position. Do 2 sets of 15. For more resistance, move farther away from the door. After these exercises get easy, strengthen your buttock muscles by doing lunges. Lunge: Stand and take a large step forward with your injured leg. Keep your trunk upright. Dip your other knee down toward the floor, bending your back leg. Then step back to the starting position. Do 2 sets of 15. Copyright ©2014 McKesson Corporation and/or one of its subsidiaries.